Beach Korf is back in 2019, and better than ever! Following on from the success of the Korfball exhibition at the Australian Beach Games, this season is looking to be our best yet. Team nominations are now open, and for the first time ever, you can also nominate as an individual to be placed in a team. This social competition is open to players and teams at all skill levels, and any inexperienced individuals will be paired up with a more experienced team to show you the ropes. Once again, all matches will be on the Glenelg Foreshore (south of the jetty) on Friday nights, with plenty of food and drink options available to keep the social going after matches have finished. This year’s season kicks off on the 18th of January, and the last round of matches will be on the 22rd of February. Depending on the number of teams involved, teams will be playing at least two games a night, and hopefully three. Nominations must be in by January 15th, and can be submitted using the form below (or here). The whole competition is $50 per team, with no weekly match fee. Players must be individually registered with Korfball Australia, a nominal $10 fee for insurance purposes, which then covers the player for all Korfball Australia and Korfball South Australia sanctioned competition for the entire year. For a team of the bare minimum 4 players, the total cost works out to just under $4 a week per player. Payment and registration details will be sent to the nominated team contact once a team is registered. There are no restrictions as to who may be in each team, outside of requiring at least two males and two females per team (more on that below). Depending on the number of teams, the competition may be split into divisions at the discretion of the organiser. Matches this year will be played under the proper IKF Beach Korfball rules, eliminating some of the modifications we’ve used in past years. For anyone who has played in previous Beach competitions, or the K4 format, there are many similarities. If you haven’t played before, no sweat, Beach Korfball is designed to be easy to pick up, and is perfect for new players. Beach Korfball is played in a single division, with two korfs in the division. 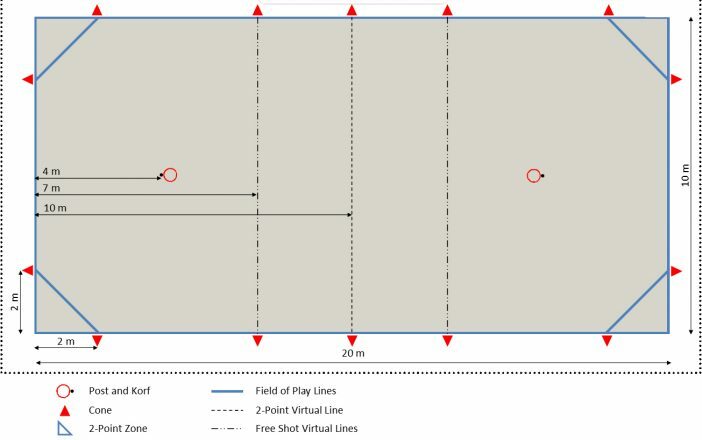 This year also sees the introduction of two-point zones, with any shots made from the defensive half of the court, or in the offensive corners, worth two points instead of the traditional one. A diagram of the new court layout is below. Matches are played over two halves of 6 minutes each. Each team defends one korf, and attacks the other. Teams must be comprised of at least two males and two females, with all four players on the court at once (a departure from previous modifications). However, there is nothing to stop teams having more than four players if they want substitutes. Substitutes may come on the field at any time, so long as a teammate of the same gender leaves at the same time. Aside from that, just about everything else is as it is in the K4 or K8 variants of the game, such as no defending players of a different gender, and no shooting while being closely defended. The complete rules can be found here. Once all nominations are finalised, team contacts will be notified, and the timetable will be released on the Beach Korf page. Is your team willing to be topped-up with additional players?